What is Green Grass Seed? Green grass seed is used when planting lawns. Green grass seed refers to the seeds used to grow grass like that used for lawns, as opposed to wild grasses, which are not always green. 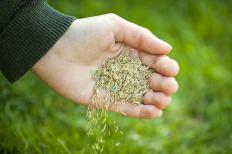 One of the most common uses for green grass seed is for planting a lawn from seed, where sod is not a desirable option. Using a lawn seed is less expensive than planting sod, though the results, of course, take much longer to come. Starting a lawn from green grass seed can be labor-intensive, but also rewarding for someone interested in gardening and home improvement. Like most seeds, green grass seed has certain defined parts to it that serve certain purposes in the eventual development of a plant. At the center of the seed is the embryo, which is the part that will grow into a mature plant. Surrounding the embryo is a material called the endosperm, which provides all the nourishment that a seed needs in the early part of germination. This nourishment comes in the form of complex carbohydrates or starches, as well as oils and protein. Seeds come in numerous shapes and sizes, and green grass seed is among the smallest. Not all lawn seeds are the same, or work well in all climates, so it will be necessary to find out which seeds are suitable for lawns in your area, if you want to grow one from seed. There are three general categories used to classify the many varieties of green grass seed, having to do with general climate patterns. These are warm season, cool season, and transitional area seeds. In general, a cool season lawn is best suited to areas that typically see a significant volume of winter snow and/or rain. These areas are normally in higher elevations and northern latitudes. Warm season lawn seeds are best for areas with hot, long summers and brief, mild winters. In between these are the transitional areas, in which it is not uncommon to apply both types of seeds at different times of the year, to keep a lawn growing year-round. Most countries in the middle latitudes, such as the U.S., have all three types of climate areas in them. Once a suitable species of lawn has been determined, growing a lawn or supplementing an existing one with green grass seed involves time and care, but can produce great results if done correctly. After the seeds have been planted on bare ground, a starter fertilizer is often beneficial, as well as covering the area with a very thin layer of mulch. At first, green grass seed must be watered often, but care should be taken to let the ground dry somewhat between watering times, otherwise the seeds may rot, and never germinate. How do I Choose the Best Grass Seed Fertilizer? What are the Best Methods for Watering Sod? What are the Best Tips for Planting Grass Seed? What is Rye Grass Seed?